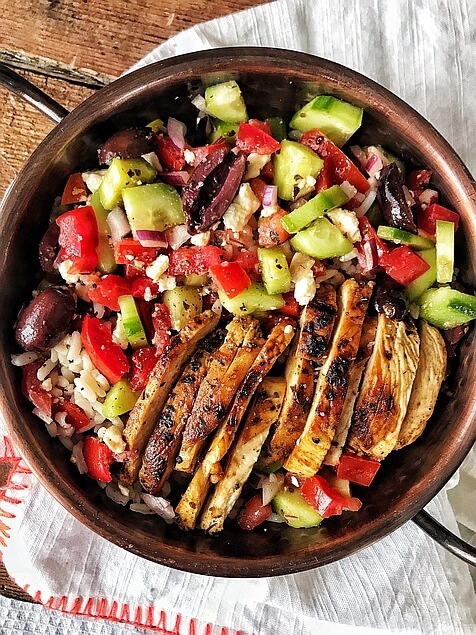 Throw these Greek Chicken Bowls together for a delicious dinner, or include them in your meal prep for lunch the entire week – either way it’s perfect! 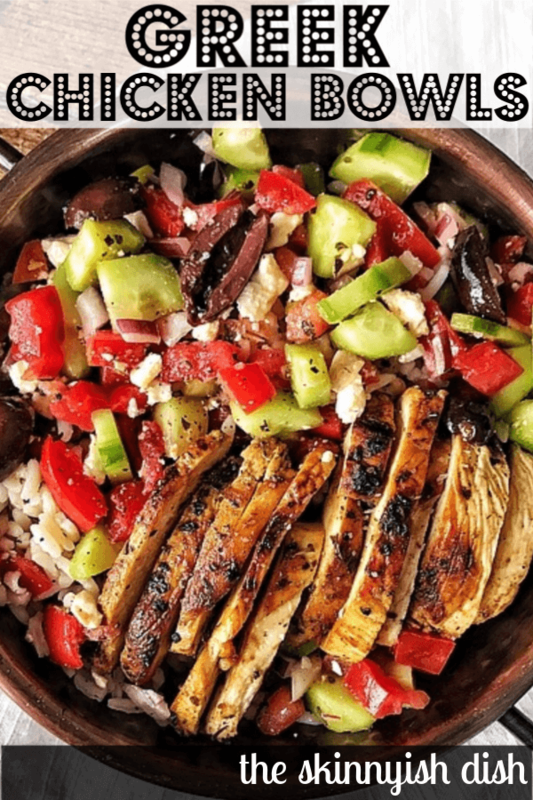 The combination of fresh, crunchy cucumber salad, chicken breast with a Greek-inspired flavor, and warm wholesome rice, all comes together in a healthy and complete meal that satisfies! When it comes to my meals, I love it all mixed up in a bowl, so that I can get a little bit of everything. Who else agrees that’s the best way to eat? Over the years, I’ve known a few people who can’t handle their foods touching. I’ve never been able to understand it. 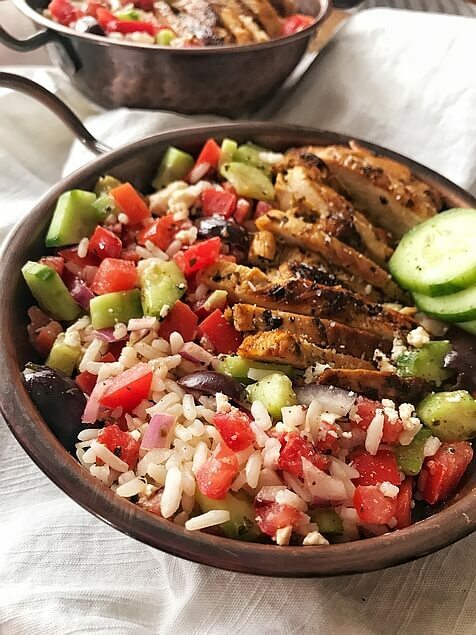 My favorite thing about these delicious little Greek Chicken Bowls is that I can get warm fluffy rice, tender & flavorful sliced chicken breast, and crisp, cool cucumber salad all in one little glorious bite. The flavors all balance each other out, and then burst forth like fireworks in your mouth! When making these bowls, you will have a few different things going on. Even so, they’re pretty easy, which has made them one of my new go-to’s! If you’re meal prepping these, I do advise to keep the Greek Cucumber Salad in a separate container; because while the rice and chicken is best warmed up, the salad part should stay cool and crisp right up to the moment it’s mixed in. First off, We’re going to marinate some chicken breast. 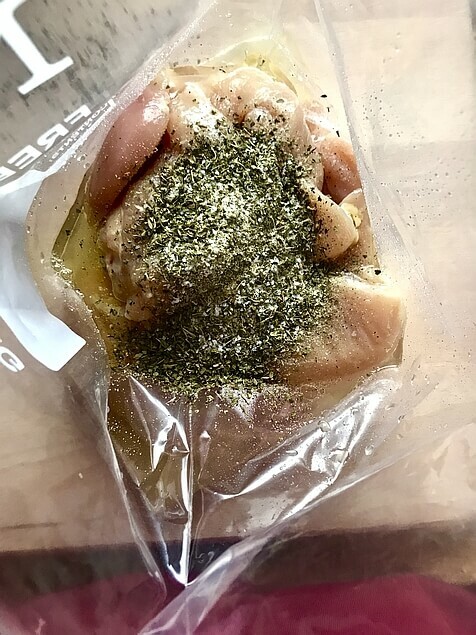 Grab a large Ziplock bag (I recommend a gallon size freezer bag) and throw in 1-1/2 pounds of fresh chicken breast. I slice each breast in half lengthwise, so that the breasts are thinner. This makes it quicker when you go to cook’m up on a skillet, and they’ll cook more evenly as well. 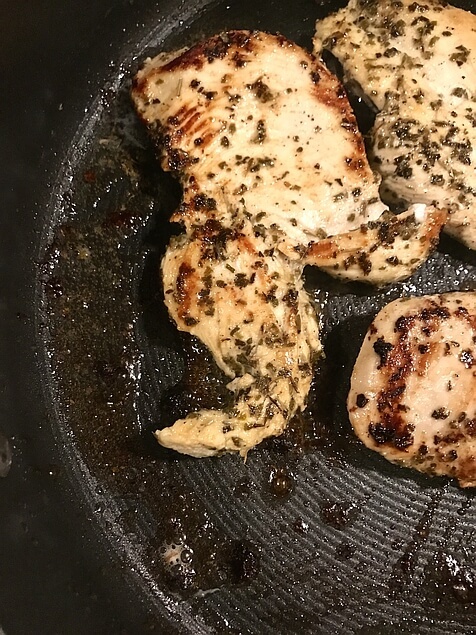 In the bag you’ll add 2 tbsp olive oil, 3-4 tbsp lemon juice (1 lemon) , 1 tbsp white wine vinegar, 1 tsp garlic powder, 1 1/2 tbsp dried oregano, 1 tsp kosher salt, and 1/2 tsp freshly ground black pepper. Just a note: I don’t count all of the olive oil in the nutritional information and points because when you take the chicken out and discard the marinade it’s mostly being thrown out. Close the bag tightly, and then massage the chicken and marinade together. You can marinate the chicken for up to 8 hours, or for as little as 30 minutes. Trust me, it will give the chicken a big boost in the flavor department. If you have the time, go for the 8-10 hour marinating! This is totally a personal preference here. I don’t like the more liquid part of tomatoes in salads, bruschetta, guacamole, etc. I think it really waters down things and takes away from the overall textures and tastes. So in conclusion, I get rid of it! You can do this or not, totally up to you. 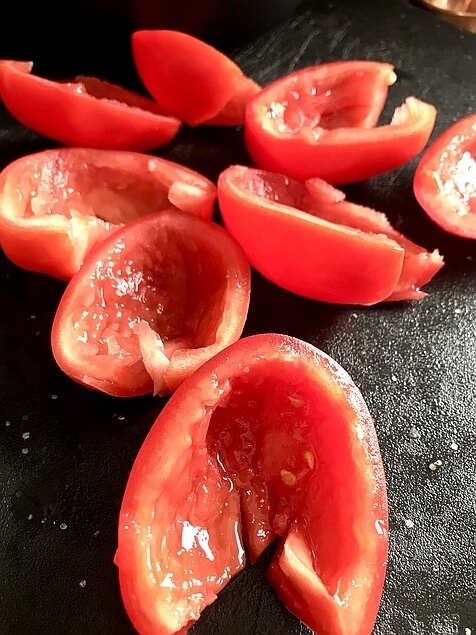 Dice the tomatoes up into small pieces. Slice 29 kalamata olives in half. I know, 29 olives, how random! That’s what you’ll need to hit the correct nutritional info/points value. After they’re sliced up, it’s about a half cup-ful. If Black Olives are more your thing, or if you can’t find any of the Kalamata, you can substitute Black Olives. but I really love Kalamata Olives. And even in our smallish town, I’ve been able to find them at local grocery stores. Dice 1/2 of a small red onion. Important- If you have a large red onion, please use only 1/4 of it. Raw onion can easily take over the taste in a dish, so we just want a kiss’a it to round out the flavor. Cucumbers. Use an English Cucumber, or a few of those baby cucumbers. I don’t have any serious beef with regular ol’ cucumbers, but sometimes they can be bitter; English or Baby Cucumbers are a much better option. You’ll need 2 cups of’m, chopped up. 1/2 cup Greek Crumbled Feta Cheese, aka the best dang cheese on earth. Now throw it all in a big ol’ bowl, and add 1 tsp of Oregano, 1/4 tsp Dill Weed, 1/2 tsp Garlic Powder, 1 tsp Kosher Salt, 1 tbsp Olive Oil, and 2 tbsp White Vinegar. Stir together well, and Salt & Pepper to taste! For very best results, I recommend you throw it in the fridge while the chicken and rice is cooking up, to let all those great flavors get acquainted… but in truth, it tastes good right away. 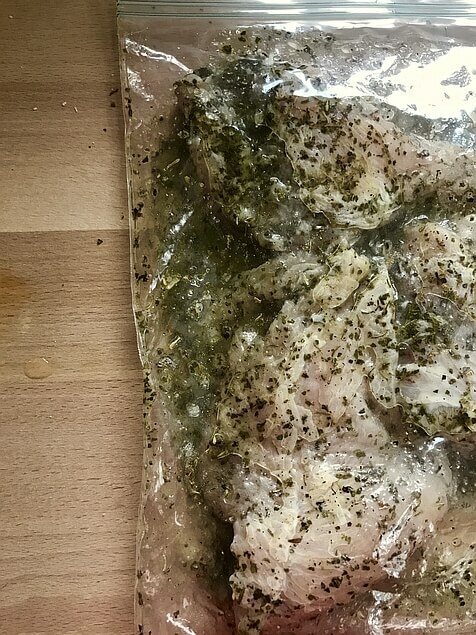 Now that yer chicken is done marinating, remove it from the bag, and dab it with a paper towel. You don’t want to wipe everything off, just the extra. Heat up a large skillet over medium heat, and add 1 tsp Olive Oil. Cook the chicken for about 4-5 minutes on each side. We need to hit that safe and magic internal temp of 165 degrees. Ideally, the meat will be perfectly browned on the outside. The best way to cook chicken is to always check the temp when you think it’s almost done, and then let it rest when you are done. So please, don’t cut into that chicken breast to check if it’s still pink, alright? If you do, that fragrant cloud of vapor might smell great… but it’s really all your flavor and juiciness, floating off to that big dinner table in the sky. Y’all need a meat thermometer? Click here for the one I love. Make up some rice while your chicken is resting/cooking! Honestly, this is not any special or magical rice, just plain ol’ white rice. 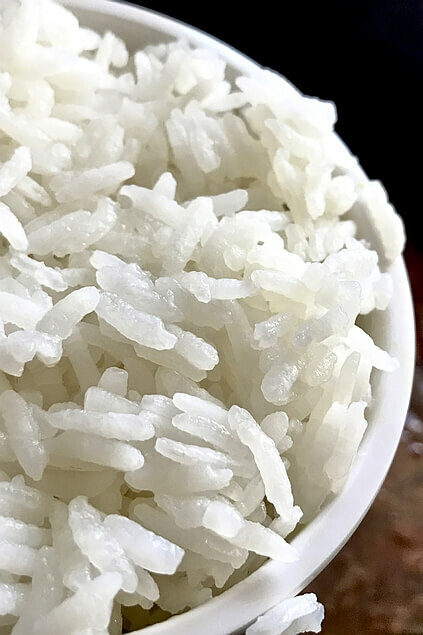 You’ll need one cup of cooked rice total so that each bowl has 1/2 cup. You can use whatever you have on hand. With everything else in this recipe being so flavorful, it’s fine to keep it pretty plain. It just really didn’t need much besides a bit of seasoning with some salt and pepper. Boil two cups chicken broth and 1/2 tsp salt in a large sauce pan with a tight fitting lid. When water reaches a boil, add rice and give it a quick stir. Cover, and reduce to a simmer. Continue to cook, covered, for about 18 minutes. Remove from heat, uncover and let the rice sit for just a minute. Fluff with fork and Salt & Pepper to taste. Now that your chicken has rested and cooled just enough, slice it or dice it on up y’all. And I absolutely insist that you grab a piece and eat it right up… because it’s soo good. Mmm Mmm! Assemble each bowl by adding 1/2 cup of rice, 3/4 cup of the cucumber salad, and 4 oz of cooked chicken. And now – DEVOUR. BECAUSE IT’S SO DANG GOOD. Seriously, make this sooner than later! You’re gonna love it. And don’t forget – If you’re making these up for lunches throughout the week, keep the cucumber salad part in a separate container. That way you can heat up the chicken and rice, and then combine it with the veggies while they’re still cool and crisp… it’s perfection! 2 cups white rice, cooked salted & peppered to taste. In a large ziplock bag add raw chicken and all of the marinade ingredients above. Close bag. Massage the marinade into the chicken breasts. Place bag in a bowl and refrigerate for up to 8 hours or as little as 30 minutes. When the chicken is done marinating: Remove chicken from marinade and discard access marinade. 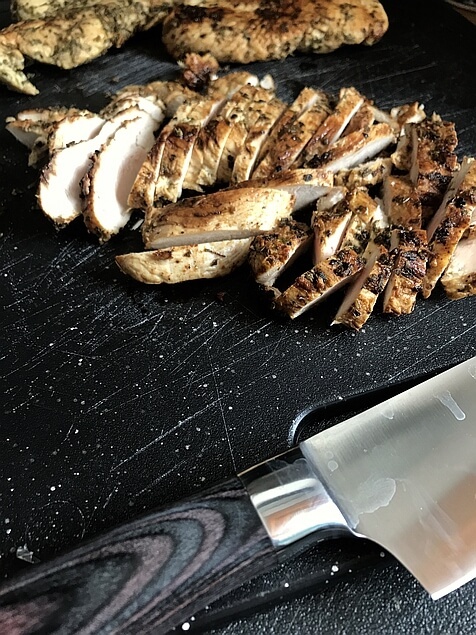 Dab the chicken breasts with a paper towel to remove a little of the extra marinade, but not all of it. Heat a large skillet over medium heat. Drizzle 1 tsp of olive oil into the skillet. Cook chicken for about 4-5 minutes on each side until golden brown and the internal temp reaches 165 degrees. Remove chicken from the pan. Set aside and let it rest for about 8-10 minutes. Slice the chicken up into strips after letting it rest. 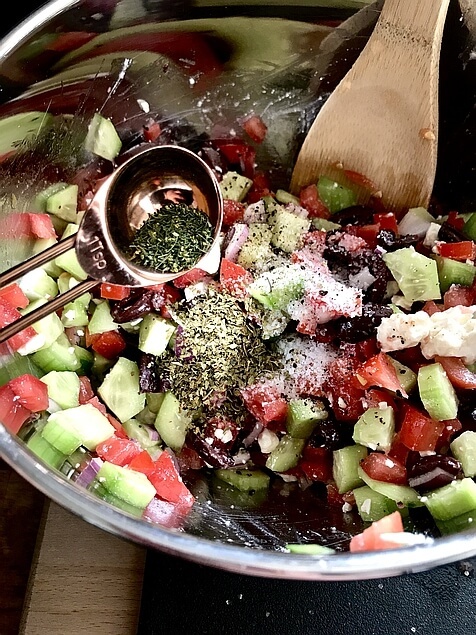 Add all ingredients for the cucumber salad above into a bowl and mix together well. If eating right away add 1/2 cup rice, 3/4 cup cucumber salad, and 4 ounces of diced chicken to each bowl. 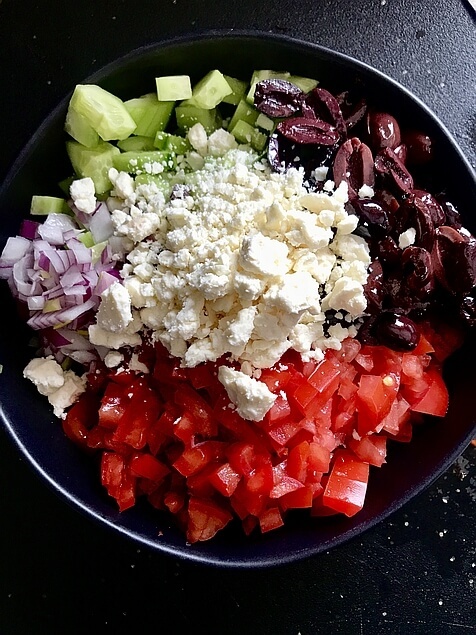 Top with extra feta, if desired. If making this to eat throughout the week combine the chicken and rice and place the cucumber salad into a separate container. I made this tonight and it was amazing! Thank you for sharing these delicious and flavorful recipes with the best tips! I want to make this it looks so yummy! Is there a way to see this recipe without all of the advertisements? Is it printable? Yep the printer friendly version is at the bottom of every page. If you scroll down right after I say “with love from my kitchen to yours” it’ll be right there and there’s a print button that’ll print easy peasy. Hope you enjoy! I LOVE this recipe! I’ve made this a couple of times now and I love it. I think this would be a great, light summer dish. The first time I made this, I didn’t have white wine vinegar or white vinegar, so I used the apple cider vinegar I had in place of those and it tasted great. The 2nd time I made this, I didn’t have a red onion and I used a white onion….definitely think the red onion was better. I am not an olive fan, so omitted those from the recipe and it tasted fine. Thanks again for the awesome recipe – this one is a keeper!! I am so impressed with this recipe. It is seriously so delicious! I will definitely be making this again and again! You are my homegirl! You always come through with the BEST recipes. This was a whole family hit! I’ll definitely be making it again soon!! Holy Cow! These bowls are seriously amazing. I don’t know how you keep thinking up such incredible recipes but keep ’em coming! I just love to eat and I’m constantly thinking how to make things at home. I guess it pays to live in a small town that doesn’t have great take out anywhere! hahaha! I’m so happy you enjoyed them, Erica! You have pretty much saved me from a non creative diet of chicken and eggs. I have started WW and this dish is SO GOOD! I omit the rice and just dive into the salad and chicken. I love your other recipes too. Trying the potato soup this week. THANK YOU!! That means so much to LeAnne! SO happy to see you’re loving the recipes so much! O.M.G. I made this recipe on a whim. Needed to cook chicken immediately and had everything on hand. It’s snowing outside in the Northeast and in the very first bite, I got so excited for NJ farmers markets in the summer. This is a keeper. Saved. Bookmarked. Pinterested. LOVE THAT! I’ve never been to an NJ Farmer’s Market, but it makes me so happy that these Greek Chicken Bowls gave you that feel! Thanks for stopping by to let me know and rate the recipe, Amanda! Made this last night and it was fantastic! I followed the recipe exactly and couldn’t have been happier with the results. Definitely a “do again” recipe!! Yay! So good to hear that you loved’m, Karen! These bowls have quickly become a favorite of mine too! I didn’t think I’d be able to do greek flavor myself until I actually tried. So, so good! I loved the flavor combination! I will definitely make this again! Thanks for these delicious recipes. This was SO delicious! Even my sometimes picky husband loved it! Thank you for another great recipe!!! I’m so happy you loved them!! Thanks for stopping by to let me know and rate the recipe!! I am legit obsessed with these. This is on my lunch menu next week for sure! One question. Recipe calls for one cup of rice, 1/2 of rice to each bowl. Is this right? Says 4 servings. Do I need two cups of rice or 1/4 cup in each bowl? The recipe says it serves 4, and requires 1 cup of cooked rice. But 1 cup of cooked rice split 4 ways is 1/4 c per bowl, not 1/2 as listed in the recipe notes. So do we use 2 cups of cooked rice split 4 ways for 1/2 c per bowl, or should it be 1/4 c per bowl? Love your recipes, can’t wait to try this one! Hi Jill! Oh my gosh. You are so right. I can’t believe I didn’t catch this while editing multiple times. Thank You! I am fixing it immediately. It is 1/2 cup cooked rice and I’ll have everything updated this afternoon. Thanks again for that catch!